Dr. Aditya Gupta is highly knowledgeable and skillful neurosurgeon presently practicing in the World’s renowned Artemis Hospital, Gurgaon. Cofounded the Institute of Neurosciences at Medanta Hospital. A graduate and topper from All India Institute of Medical Sciences (AIIMS), Dr. Aditya Gupta is an accomplished and experienced neurosurgeon. As a student, resident and later Faculty at AIIMS, he has won several awards, such as the prestigious Sir Dorabji Tata Award. He was Associate Professor of Neurosurgery at AIIMS till late 2009. 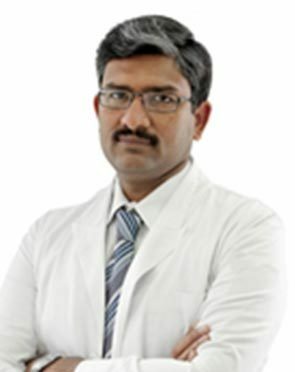 Dr. Aditya has not only developed excellent surgical techniques for a wide variety of brain tumors, spine diseases, but also has special and unique skills in managing patients with Movement Disorders with Deep Brain Stimulation (DBS), Surgery for Epilepsy, Nerve and Brachial Plexus Surgery, Radiosurgery as well as Cerebrovascular Surgery. He contributed significantly to the setting up and success of all these programs at AIIMS. He has trained abroad at several universities for these specialized skills. Dr Aditya has more than 40 publications and chapters in books, and has been invited speaker at several national and international conferences and on national television. Gupta A., Singh V.P., Bhatia M.et al: Surgery for epilepsy: AIIMS experience in 20 cases. Neurol India 1997, 45 (suppl 1): 17. Gupta A., Singh V.P., Bhatia M. et al: Dysembryoplastic neuroepithelial tumor: a cause of intractable epilepsy in young patients. Neurol India 1999, 47(suppl 1):27. Gupta A., Singh V.P., Mehta V.S. et al: A study of EVD associated infections. Neurol India 1999,47(suppl 1):17. Mehta VS, Gupta A.: Stereotaxy in Neurosurgery (editorial) JIMSA 2000; 13(4):231-2. Gupta A., Mehta V.S., Singh V.P., et al: Management of Intracranial cavernous malformations: Surgical experience and a review. 12th World Congress of Neurosurgery Proceedings 2001;pp.208. Gupta A., Mehta V.S., Singh V.P., Vaishya S.: Gamma Knife radiosurgery for pituitary adenomas: our experience and trends. 12th World Congress of Neurosurgery Proceedings 2001;pp. 134. Gupta A., Mehta V.S. : Intracranial cavernous malformations: A review and trends. Advances in Clinical Neurosciences 2001;11:469-486. Gupta A., Singh VP and Dash HH: A review of awake craniotomy: waking up to an old technique.Neuroscience Today 2001; 5(1): 52-55. Gupta A., Mahapatra A.K. : Current status of Hypothermia in Severe Head Injury Management. Gupta A., Mehta V.S., Sarkar C.: Giant cystic fibrous dysplasia of the temporal bone. J. Clin Neuroscience (Australia) 2003;10: 364-67. Gupta R, Rishi A, Suri V, Sharma MC, Gupta A, Garg A, Sarkar C. Sacral myxopapillary ependymoma with extensive osteolysis. J Neurooncol. 2008 Feb;86(3):349-52. Epub 2007 Oct 20. Dhandapani SS, Gupta A, Vivekanandhan S, Mahapatra AK and Mehta VS: Serum ionic magnesium in traumatic brain injury. Ind J neurotrauma 2005;2:103-106. (Coresponding Author). Kiran NA, Kale SS, Vaishya S, Kasliwal MK, Gupta A, Sharma MS, Sharma BS, Mahapatra AK. Gamma Knife surgery for intracranial arteriovenous malformations in children: a retrospective study in 103 patients. .J Neurosurg. 2007 Dec;107(6 Suppl):479-84.
schwannomas: report of a case without hyposmia. Acta Neurochir (Wien). 2006 Jun;148(6):671-2. Dr. Gupta performs 16 different procedures. Click on a procedure name to see more details and to view doctors for that specialty.